RABBI LEVIN: OBAMA OR ROMNEY? G_D FORBID! NEITHER! | RabbiLevin.com - Fighting for Morality! RABBI LEVIN: OBAMA OR ROMNEY? G_D FORBID! NEITHER! Rabbi Yehuda Levin who back in late December branded Gov. Romney A dangerous homosexualist for his total active support of the militant homosexual agenda (see Amy Contrada"s 600 plus page book: The Romney Deception, as well as loads of documentation on the MASSRESISTANCE website) now addresses the election. 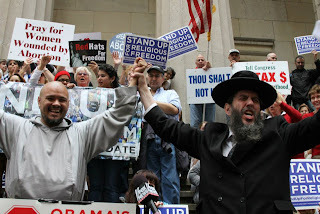 Rabbi Levin makes the point that it is far more acceptable religiously , spiritually & morally not to vote for Romney & have a loyal opposition,G-D willing,in the Senate & the House, which would energeticly thwart Obama & his agenda as they move towards midterm elections ,than to compromise with the anti G-dly values of homosexualist Gov. Romney. Levin buttresses his point by citing Republican " conservative " N.Y.Gov. George Pataki who was able to advance the militant homosexual agenda in ways that his very liberal predecessor Mario Coumo was unable to do;because he was the top Republican & both silenced & arm twisted his own people like State senate leader the disgracefull Joseph Bruno. I agree with Rabbi Levin, and I wish that Christian clergy had the guts to speak out like him. I refuse to go along with what the Republican establishment and talk radio "conservatives" are telling us that we must do: "Vote for the lesser of two evils" - namely, Romney. views they hold. They will then act accordingly and have no principle at all (which is in short supply in any case) because they will know that they have our votes locked up regardless. And, second, there is something to be said for letting the opposition get into power and having them mess things up themselves. Third, I don't think that Romney is "better" than Obama. What is so wonderful about Romney? I can't think of even one thing. Last, being a fiscal conservative (and who knows if Romney really is one) can be a rather cheap way of presenting oneself to the electorate. Even liberals claim to be fiscally responsible. No one will ever say that they believe in wasting money. Principle must go deeper than that. Romney's principles boil down to this: blind ambition. I agree with Rabbi Levin and with the first commenter. Expediency, greed and ambition, his fathers' (George Romney and Joseph Smith) modeling and Romney's religion which is a distortion of Judaism and Christianity, blended with Masonry, Islam and native-american spiritualism, have guided him in his business, political life. He is a radical liberal in sheep's clothing... like a Fabian Socialist. Romney has always sold out Biblical principles for votes and/or dollars. Romney is a consistent, proven liar, even on air during the debates and in his speeches. Romney's business and political practices are corrupt and dishonest - he cannot be trusted. Those who have endorsed Romney: Republican Party and the legislators, Jerry Falwell, who invited Romney to speak at Liberty University commencement, the Susan B Anthony and National Right to Life groups have sold out. This is the 40th year since Roe vs Wade. The Pastors and religious fathers of our nation's Synagogues and Churches, Christian Universities, the Civic fathers: legislators, judges, governors, mayors have allowed the culture, the agenda groups promoting unbiblical and unhealthy agendas and lifestyles to erode their hearts and minds. They have denied the Truth of Scripture, ignored evidence in science, statistics, medical practice and real life and given way to pressure, irrational and false arguments... and we now have laws that enable us to break all of God's laws and commandments and some that would force us to do so. May G-D wake us from our sleep, open our eyes, minds, hearts, ears to see and cherish and seek His Good Kingdom, His Way of Love, Truth, and Life...the holy highway ascending to Jerusalem. (Yah-Yireh-Shalom: the worship, reverent awe, obedience, service to G-D leads to His peace and all blessings). Rabbi Levin said: "All things are spiritual..." We must return to the One True G-D and His True Word/Law/Commandments...and His True and Eternal Way of Righteousness, Peace and Joy. Jews are clearly held in low regard by one of the former Prophets and Seers of the Mormon Church. Brigham Young said that his word was to be upheld as scripture; therefore we can see the dangers in the words of a man who clearly had a heart filled with hate. Yet, in 1st John Chapter 4, verses 20-21, the Bible plainly states that we cannot love God if we hate others;"